Treat your skin to a purifying mud facial without the mess of traditional masks. 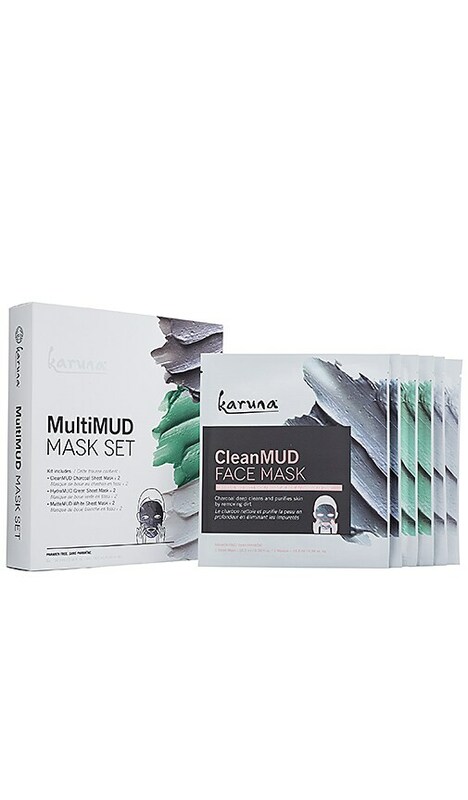 Featuring two of each sheet mask from Karuna's MUD line, the MultiMUD Mask Set refines pores, restores hydration, promotes elasticity, and balances the complexion with a blend of powerful ingredients. Antioxidant + Face Mask: Water (Aqua), Glycerin, Glycosyl Trehalose, Niacinamide, Chamomilla Recutita (Matricaria) Flower Extract, Chrysanthemum Indium Extract, Camellia Sinensis Leaf Extract, Aloe Barbadensis Leaf Juice, Dipotassium Glycyrrhizate, Butylene Glycol, Sodium Hyaluronate, Hydrogenated Starch Hydrolysate, Hydroxyethylcellulose, Salicylic Acid, Acacia Senegal Gum, Isoceteth-20, Allantoin, Palmitoyl Oligopeptide, Palmitoyl Tetrapeptide-7, Polysorbate 20, Carbomer, Ethylhexylglycerin, Phenoxyethanol, Fragrance (Parfum), Butylphenyl Methylpropional, Hexyl Cinnamal, Linalool. Brightening + Face Mask: Water (Aqua), Glycerin, Niacinamide, Chamomilla Recutita (Matricaria) Flower Extract, Saxifraga Sarmentosa Extract, Scutellaria Baicalensis Root Extract, Morus Bombycis Root Extract, Vitis Vinifera (Grape) Fruit Extract, Aloe Barbadensis Leaf Juice, Dipotassium Glycyrrhizate, Butylene Glycol, Sodium Hyaluronate, Glycosyl Trehalose, Hydrogenated Starch Hydrolysate, Hydroxyethylcellulose, Salicylic Acid, Acacia Senegal Gum, Isoceteth-20, Palmitoyl Oligopeptide, Palmitoyl Tetrapeptide-7, Polysorbate 20, Carbomer, Disodium EDTA, Ethylhexylglycerin, Phenoxyethanol, Fragrance (Parfum). Exfoliating + Face Mask: Water (Aqua), Niacinamide, Glycosyl Trehalose, Citrus Medica Limonum (Lemon) Fruit Extract, Chamomilla Recutita (Matricaria) Flower Extract, Ananas Sativus (Pineapple) Fruit Extract, Aloe Barbadensis Leaf Juice, Dipotassium Glycyrrhizate, Glycerin, Butylene Glycol, Propylene Glycol, Sodium Hyaluronate, Hydrogenated Starch Hydrolysate, Hydroxyethylcellulose, Salicylic Acid, Acacia Senegal Gum, Arginine, Isoceteth-20, Allantoin, Palmitoyl Oligopeptide, Palmitoyl Tetrapeptide-7, Polysorbate 20, Carbomer, Ethylhexylglycerin, Phenoxyethanol, Fragrance (Parfum). Hydrating + Face Mask: Water (Aqua), Sodium Hyaluronate, Glycerin, Sodium Lactate, Niacinamide, Chamomilla Recutita (Matricaria) Flower Extract, Aloe Barbadensis Leaf Juice, Sodium Polyglutamate, Dipotassium Glycyrrhizate, Butylene Glycol, Palmitoyl Oligopeptide, Palmitoyl Tetrapeptide-7, Glycosyl Trehalose, Hydrogenated Starch Hydrolysate, Isoceteth-20, Polysorbate 20, Hydroxyethylcellulose, Carbomer, Ethylhexylglycerin, Phenoxyethanol, Fragrance (Parfum). Renewal + Eye Mask: Water, Propanediol, Glycerin, Corallina Officinalis Extract, Cordyceps Sinensis Extract, Trametes Versicolor (Mushroom) Extract, Algae Extract, Angelica Polymorpha Sinensis Root Extract, Centella Asiatica Extract, Calendula Officinalis Flower Extract, Arctium Majus Root Extract, Chamomilla Recutita (Matricaria) Flower Extract, Glycyrrhiza Glabra (Licorice) Root Extract, Scutellaria Baicalensis Root Extract, Aloe Barbadensis Leaf Juice, Sodium Hyaluronate, Butylene Glycol, Propylene Glycol, Panthenol, Allantoin, Hydrolyzed Yeast Protein, Ammonium Glycyrrhizate, N-Hydroxysuccinimide, Palmitoyl Tetrapeptide-7, Palmitoyl Oligopeptide, Chrysin, Steareth-20, Ascorbyl Glucoside, Escin, Polysorbate 20, Carbomer, Arginine, Ethylhexylglycerin, Phenoxyethanol. 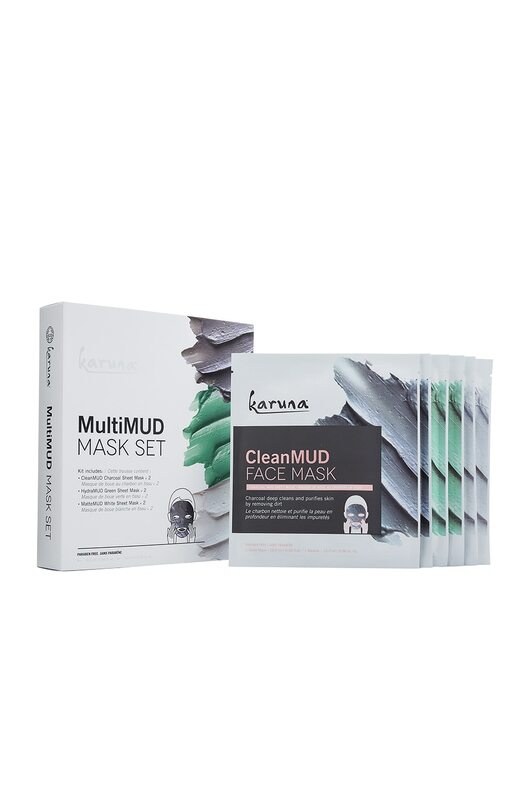 Clarifying + Face Mask: Water (Aqua), Chamomilla Recutita (Matricaria) Flower Extract, Arctium Lappa Root Extract, Honey Extract, Aloe Barbadensis Leaf Juice, Glycerin, Butylene Glycol, Propylene Glycol, Glycosyl Trehalose, Niacinamide, Sodium Hyaluronate, Hydrogenated Starch Hydrolysate, Dipotassium Glycyrrhizate, Hydroxyethylcellulose, Salicylic Acid, Acacia Senegal Gum, Allantoin, Isoceteth-20, Palmitoyl Oligopeptide, Palmitoyl Tetrapeptide-7, Polysorbate 20, Nordihydroguaiaretic Acid, Oleanolic Acid, PEG-60 Almond Glycerides, Caprylyl Glycol, Carbomer, Ethylhexylglycerin, Phenoxyethanol, Fragrance (Parfum). Age-Defying + Face Mask: Water (Aqua), Calendula Officinalis Flower Extract, Dioscorea Villosa (Wild Yam) Root Extract, Chamomilla Recutita (Matricaria) Flower Extract, Sambucus Nigra Flower Extract, Aloe Barbadensis Leaf Juice, Niacinamide, Glycosyl Trehalose, Dipotassium Glycyrrhizate, Glycerin, Butylene Glycol, Propylene Glycol, Sodium Hyaluronate, Hydrogenated Starch Hydrolysate, Hydroxyethylcellulose, Isoceteth-20, Palmitoyl Oligopeptide, Palmitoyl Tetrapeptide-7, Polysorbate 20, Carbomer, Ethylhexylglycerin, Phenoxyethanol, Fragrance (Parfum).